Every year the Washington Area Bicyclist Association hosts event rides that are based on a gimmick. The March Vasa Ride, held in cooperation with the Swedish embassy, commemorates Sweden’s Vasaloppet cross country ski event. The Cider Ride in November involves riding over 50 miles at the end of apple picking season. And, of course, the 50 States Ride presents participants with an 11-page cue sheet to more or less guide them all over the city to ride the avenues named for the 50 states. So it occurred to me that WABA’s year end fund raising could use a little push from a gimmick. Here’s my idea. So I thought maybe I’d ask my friends to all go out and ride 88.5 miles on December 31. This would be fun (albeit flippin’ cold) for them but wouldn’t accomplish much. Instead, I decided to invite my #bikedc friends (and any others who are feeling generous) to donate $88.50 to WABA. You money will be used to fund the new pulmonary embolism wing of the state-of-the art WABA Wellness Center. Your money will help fund the many programs, events, and advocacy efforts that WABA conducts on your behalf. And it will put a smile on my face. So clink on this link to donate. And if you can’t spare $88.50, you could always spring for some fashion fabulous WABA socks. All the cool kids are wearing them. All you have to do is go to the WABA store. I finally got off the consistency schneid and broke the 800-mile barrier for a month of bike riding this year. 812 to be exact. 532 miles riding back and forth to work with a couple of side trips to Nats Park. That’s 18 more bike commutes. Little Nellie did 50 miles and the Cross Check provided the rest of the transport. My long ride of the month was the Whites Ferry century (101 miles) on my Cross Check. Little Nellie jumped in the trunk of my car for romps in Rhode Island and New Jersey. So far this year I’ve ridden 4,869.5 miles. If I just straightened this out I’d be somewhere south of Lima by now. 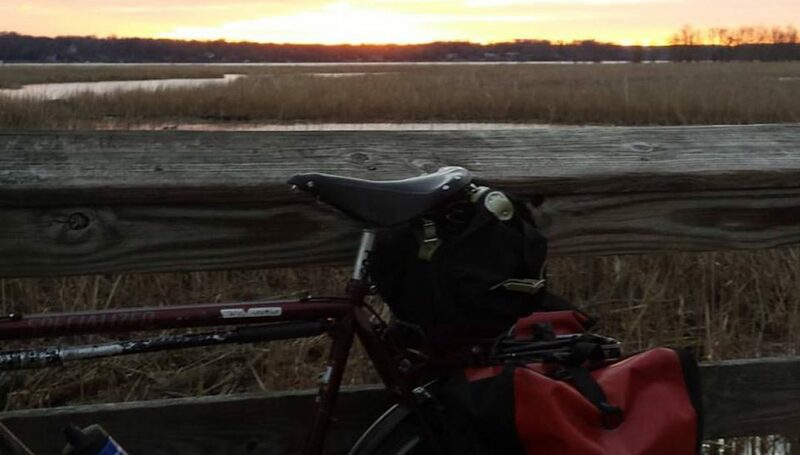 3,489 miles are attributable to 119 bike commutes. That could get me to the west coast. By now. If I started in early May. P. S. I am really grateful for the help Laura Miller from WABA gave me today to get a friend signed up as my guest for this year’s 50 States Ride in September. Ella no será un novato esta vez. The Tour de Fat is an event put on by New Belgium Brewing to raise money for local bike organizations. This year they moved the event to the late afternoon and from May to July. After last year’s chilly rain, we were treated to lines of violent thunderstorms this year. I rode to the the event venue located next to Nationals Park. The skies were ominous. I have expected to see the Avengers fighting some big alien-ish beasties before going out for schwarma. As I reached the halfway (8-mile) point a strong headwind with gusts started buffeting me about. I passed a couple who were dressed in costumes, obviously heading to the event. I did a 180 and rode up the ramp to the 14th Street Bridge. The wind pushed me hard and then the rains came. Turning onto the bridge the wind and rains were coming from my left. After 30 seconds I couldn’t see a thing. I slowed. On coming bikes had their lights on so I turned on my blinkies. The rain and wind abated. I made it to the venue a little after 3 pm. There were very few people. Some of the tents were not assembled. A bystander told me the event was canceled because of the weather. They had begun breaking the tents down. I rode back home by way of the Del Ray Music Festival in Alexandria. It rained for the first couple of miles but then the sun came out. The Festival was on but I didn’t see anyone I knew so I rode home. It was hot and muggy but there was no wind or rain. I was pretty exhausted when I got home. Prior to riding to DC I mowed the lawn and did some chores outside. The combination of all three efforts left me dehydrated. So I opened a New Belgium Fat Tire Ale. I went on the WABA website and gave them a five-beer donation ($25). Although the event was listed as rain or shine, the storms hitting DC today had very high winds and lightning. The event organizers did the right thing to cancel. It would have been chaos if tents started blowing over or a lightning strike occurred. As I write this, a storm has been raging outside. I would have been riding home from the event in this. No thanks. I do have some advice for New Belgium: move the event in DC back to May. The weather is generally better, there are more people in town, and you can line it up with other events as was done in 2016. Also, move it back into the daytime and involve cycling families. They are an integral part of the bicycling scene in DC.